British users are finding it difficult to part with their desktop PC despite the number of 2-in-1 devices available, new research has found. 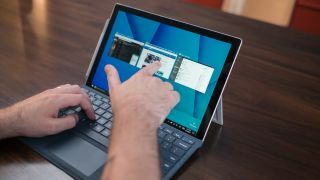 Despite the growing number of flexible devices such as Microsoft's Surface Pro, many UK users are sticking to their classic desktop, according to a report from online retailer reichelt elektronik. The firm found that only five per cent of Brits currently own a 2-in-1 device, despite many analyst predictions that the form factor will be the major growth sector in years to come, with 84 per cent saying that had never used such a device. Older users were the biggest fans of desktop PCs, with 79 per cent of over 55s still using them, compared to just 45 per cent of millennials. Tablet usage was also skewed in favour of older users, but it was 35-44 year olds who scored highest, with 52 per cent saying they owned a handheld device, with 60 per cent of all consumers saying they use a tablet more than once a week. Overall, 39 per cent of Brits own unused desktop PCs, showing that although the devices remain popular with some, their days could be numbered. “Whilst many people may still own a desktop, they’re gathering dust in the corner of the room as more portable, easy to use devices fit in with modern lifestyles and the need to be able to be connected and access videos, emails and work on the move. Millennials are driving this shift in computing choices," said Frank Gerwarth, product manager at reichelt.